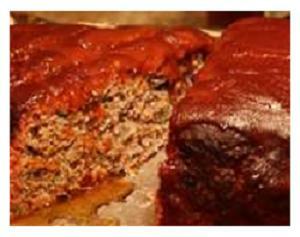 Here's a delicious Easy Meatloaf Recipe with a rich "Soul Food" flavoring. This entree goes well with almost any side dish you can imagine. Beet greens are especially recommended! 3 slices of white or whole wheat bread, grated to crumbs. Grate bread into coarse crumbs. In a large bowl, mix the beef, onion and bread crumbs together with your hands. Do not overmix. The less the food is handled, the better the recipe will taste. In another bowl, combine tomato sauce, 1/2 cup of the BBQ sauce, salt, seasoning salt, pepper and Tabasco sauce. Mix well. Pour the liquid mixture onto the meat mixture and mix thouroughly. The mixture might seem soggy, but will dry as it cooks. Place mixture evenly in a glass or metal loaf pan. Lay the sliced mushrooms on top so they cover the meatloaf. In a small bowl, combine the brown sugar and remaining BBQ sauce. Spread it over the top of the loaf. Put the loaf in the oven and bake it for 45 to 50 minutes. SUGGESTION: When done, remove the meatloaf to a serving platter and make gravy from the drippings by adding a sprinkling of flour and two tablespoons of hot water to the pan. Mix it with a fork, adding more water as needed to attain the desired thickness. Pour some gravy over each individual serving. SERVING SUGGESTION: Serve with fresh sauteed beet greens, baked yams, and cornbread. In a large bowl, add cheeses, nuts, eggs, bread crumbs, onions, mushrooms, 3 tablespoons of soy sauce, 3 tablespoons of ketchup, and a teaspoon of Worcestershire sauce. Combine all ingredients with your hands until it sticks together as a meatloaf should. Place the mixture evenly in a lightly greased, glass or metal loaf pan. In a small bowl, combine another tablespoon of soy sauce and another 3 tablespoons of ketchup. Pour this over the top of the loaf and spread with a fork if needed. Put loaf in the oven and bake for about 45 minutes. SERVING SUGGESTION: Serve with fresh steamed green vegetables.